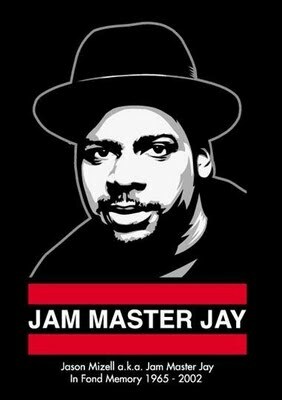 My computer has already crashed once tonight, so this won't be the longest editorial in the world, but I found myself reminiscing over Jam Master Jay recently and thought I would share a few of my thoughts with the rest of you. As a child of the 1980's I had several hip-hop aspirations - I wanted to break like Crazy Legs, I wanted to flow like Melle Mel, and I wanted to deejay like Jam Master Jay. It's safe to say I never achieved any of those goals, largely due to being a nerdy kid from the rural Midwest, but it didn't stop me from dreaming. Despite our obvious differences in background and origin, the one thing I had in common with these hip-hop pioneers was big dreams, and few dreamed bigger than Jason Mizell. He wanted to deejay from an incredibly young age, and worked his whole young life "just to join a band" until Darryl McDaniels (D.M.C.) and Joseph Simmons (Run) finally gave him that opportunity. Out of all of my hip-hop dreams, Mizell's was the only one I came reasonably close to. I scratched records on things you weren't supposed to just because I didn't have Technics 1200s and couldn't afford them. I'm sure you could look through my parents attic and find some Fisher Price and hand cranked turntables that are either broken or unusable in their present condition. Some of the records I had back then didn't fare much better, including a soundtrack to the movie "Tron " that got so thoroughly shredded it was actually shattered into pieces just to put it out of its misery. All along my goal was to imitate the sounds and styles of my two favorite turntable wizards - Grandmaster Flash and Jam Master Jay. The word "master" in their names summarized their excellence. There was a time in my young life where I actually believed you couldn't be a deejay unless you trained under a "master" and were given the title yourself, much like jiu-jitsu students today train under masters of submission to earn progressively higher belts. When the discussion turns to hip-hop artists who were taken from us before their time, the discussion inevitably starts with Tupac Shakur and Christopher 'B.I.G.' Wallace. Once again being a child of the 1980's gives me a different perspective. As tragic as their deaths were in the 1990's, I remember the deaths of Scott LaRock, Cowboy and Trouble T-Roy coming well before - and songs like "Self Destruction" reflecting hip-hop's collective angst over the needless death of these members of the community. As much as I enjoyed the song and applauded KRS-One's leadership in that effort, it sadly didn't change the landscape in the 1990's - the deaths only got worse and more high profile and even became a coastal beef for many years going forward. If I had any hope that things would get better in the 2000's the murder of Jason Mizell on 10/30/2002 only left me heartbroken all over again. Selfishly I wanted to meet Jay and tell him what an influence he had been on my life, to have him autograph one of my Run-D.M.C. albums, to maybe have had a chance to learn something from the master. Unselfishly I wanted ALL of hip-hop to gain from what Jay had to offer. He was more than just a deejay. Jason Mizell was also a businessman, entrepreneur and talent scout. Mizell used his own label imprint to put Onyx on the map, and continued to produce hits for other artists right up until his death, being shot in a recording studio in Jamaica, Queens. His murder like many other high profile hip-hop killings remains sadly unsolved. Thankfully one legacy of Jay's lives on - the Scratch DJ Academy he helped launch the same year he was killed. If they had that kind of turntablist educational institution when I was growing up, I might be a full time scratch master now, and not the hip-hop writer whose editorial you're reading. Whether I'm sitting at home digging in my crates or driving around listening to XM Backspin, I can't help but think about the positive influence Jay had on me and on the world as a whole. It was a measure of the respect Run-D.M.C. had for Jay that the group retired their name a week after his death - they literally couldn't imagine continuing without him. J-A-Y forever were and forever will be the letters of his name, and he left behind a legacy of cutting and scratching in the hip-hop game.